I fell into Runes in my 20s and I’m not entirely sure how. I hadn’t wanted to look at Tarot or anything clairvoyant, but deep down I knew Runes would be safe - I’ve no idea how I knew that. Or maybe it just came because I had heard ‘bad’ things about other devices and I’d heard nothing of Runes. I don’t know, and ultimately it doesn’t matter. But down that rabbit hole I went! A few books, some searching, lots of reading, and I needed a set of Runes. But none felt right. So I went and made my own. I lived in a flat without a garden as such, but I’d made a little one along my part of the back fence, and through the fence grew a privet. Armed with a little saw, I chopped off the branches that poked into my yard, then cut up the branch into rounds for my Runes. I let these dry in the sunshine for a bit. 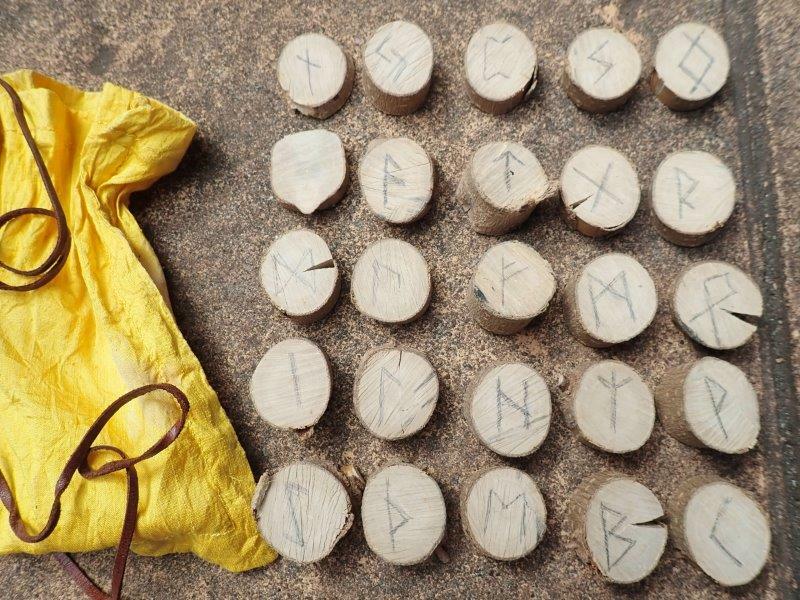 And then I wrote my Runic letters on my tree branch. I always intended to burn the marks on but I never have. I use the same Runes today, without changing a mark! And yes, I know Privet's not a plant I should have used, and I know it's better if they're stone - but these are mine, and that's the most important thing to me. Although the Runic alphabet bears little resemblance to our alphabet, I felt I had a connection to these letters and I learned what they meant from a book, or ten! In the beginning, I had no understanding of intuition being linked with what I was doing. I thought it was something I had to learn, study, and then pass my daily test as I read my spread. I used the Runes mostly when I couldn’t decide something or couldn’t work something out. I’d sit quietly and think of my problem, then pull three (usually) Runes and work on what they meant and how that may relate to the issue I faced. I refused to use them to ‘tell’ the future. I wouldn’t use them to read for others - in fact, I doubt anyone knew I read them. I made a raw silk bag with a leather drawstring in which to keep them. I kept them as natural and basic as I could. I kept the readings focussed on understanding myself and my issues. You could say they were a tool in helping me decide my life. As a kid I’d often flipped a coin to know what I wanted (and if it fell the wrong way and I had to do best of 3 or best of 5, then I knew what I truly wanted! ), and I guess this was the next progression. Something that dug a bit deeper into my psyche. Have you ever used Runes? How do you use them? Well I never would have guessed! How exciting! I've always been a bit scared to trying anything like this - like to have my tarot read or my aura read, or anything. I think I'm a bit scared about what it would say! When I read for me, I'm not capable of telling myself anything I don't really know. I can dig stuff up that I'd rather have kept buried, but I knew/know it.